Skyline Partner Open 2019 in house competition is 32 days away, grab a partner and start working! starting at the top of the minute, complete one round. 2018 CrossFit Games Open Workout #4. This year at Skyline we will be doing things a little differently! We will be doing the Open as Partners and Skyline will be having a In house for fun competition using the Open as our platform! Grab a partner and lets get ready! "How a Low-Carb Diet Might Help You Maintain a Healthy Weight," the new york times. This benchmark workout is an all out sprint. The swings and pull-ups should be easy enough that you are still able to push the pace on the runs. Intermediate athletes can complete this workout as prescribed. Congratulations to 4 of our members for climbing on top the podium at Granite Games. Connor Pfister, Grant Billings, Keving Beckering, and Alex Lopez! Skyline ladies took 1st and 3rd at Granite Games this past weekend! Congratulations you all earned it! Lucy is showing a great way to scale pull-ups during pregnancy. She can still do CrossFit but just needs to modify to keep her and the baby safe! Skyline morning goer Glynn Johnson hitting up CrossFit Mayhem with Worlds Fittest Man (2012-2015) Rich Froning. "Want a healthier heart? Eat a steak," Houston Chronicle. Granite Games Throwdown was a success! 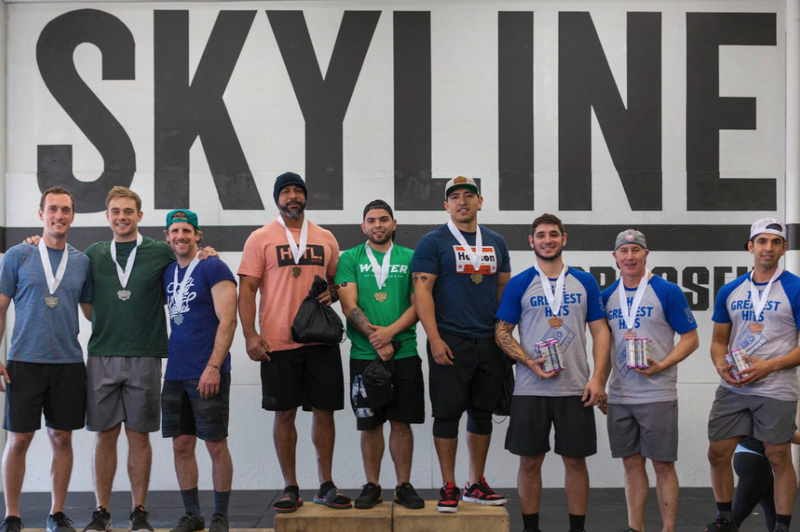 Thank you to all Volunteers, Judges, and athletes for showing what Skyline CrossFit is all about! Great day with great people! — DR. MARCIA ANGELL, from "The Truth About Drug Companies"
Team Aggressively Average is a Scaled Mens team for granite games this Saturday at Skyline CrossFit! The team consists Zane Mclain, Ethan Cook, and David Burkenstock. "BMJ: RANDOMIZED TRIAL ON THE EFFECTS OF A LOW-CARB DIET", CrossFit. Here is Andre Darrell, Mario Cicconetti, and Alex Lopez they will all be participating this weekend at Granite Games on their respective teams! "LINK BETWEEN HEALTH SPENDING AND LIFE EXPECTANCY: U.S. IS AN OUTLIER", crossfit. Team “We heard there’d be cake” Womens Scaled Team consists of Erin Roehring, Nienke Van Leusen, and Hailey Reeves. Womens Scaled Team “Wod Now Wine Later” consists of Vreni Henderson, Lauren Kroft, and Amber Carter. "CANCER AS A MITOCHONDRIAL METABOLIC DISEASE", CROSSFIT. Renegade Rows are done while in a plank position and pulling dumbbell to the ribs. This helps build the lower lat, which will increase pulling power in the chest to bar pullups and muscle up. Andrew Thompson repping Skyline on Big Sky Mountain. Work up to heavy Deadlift to the day. Intermediate Mens Team for Granite Games Jan 12th the “3 Amigos” consists of Andy Hernandez, Michael Calihan, and Charles Smiley. Intermediate Mens Team “The Godfathers” consist of Francisco Gallegos, Mason Johnson, and Ryan Garihan. "Dr. George Mann Says Low Cholesterol Diets Are Useless, but the 'Heart Mafia' Disagrees", PEOPLE.